Born in the 1960s, the third of nine children, growing up in a gang-infested suburb of Los Angeles, Joan Robinson-Berry has seen her share of racial and gender discrimination with a side of violence and personal tragedy that could have easily broken her spirit. Her father, an LA policeman, was shot while on duty Christmas Eve, 1980, after which 18-year-old Robinson-Berry helped her mother raise her younger siblings. She witnessed her brother killed by a relative and later lost a sister to lupus. Along with her husband, Robinson-Berry raised her sister’s three children and three of her own, all while pursuing a high-stakes career and striving to make her mark on the world. With an innate drive to achieve, a little outside encouragement, and a lot of faith, Robinson-Berry embraced her natural gifts early in life (including an aptitude for math and science), rising above her circumstances and going on to explore how and where she might make a difference. With over 30 years’ experience in the aerospace industry, bushwhacking her way down the path of success, today, she is vice president and general manager of Boeing South Carolina and a fine example of leadership and service. It was my privilege to peek inside the mind of this noted trailblazer via a 30-minute phone conversation. Following are a few insights from Robinson-Berry. Linda S. Hopkins: As a woman in a so-called “man’s world,” what challenges have you faced, and what advantages have you found being a woman in business? 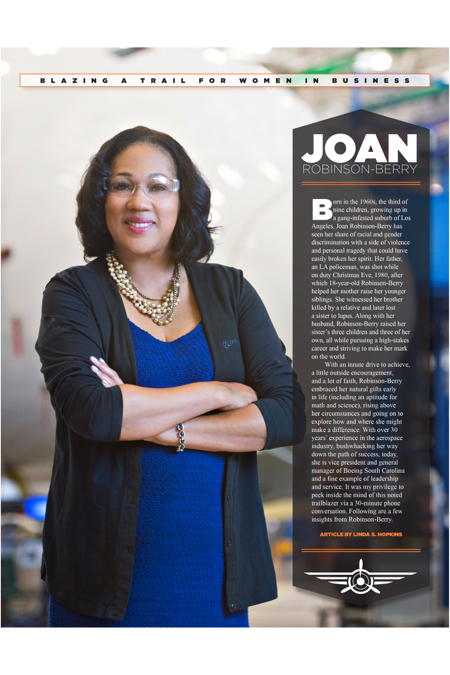 Joan Robinson-Berry: I’m in an extremely male-dominated organization: aerospace. We’re about technology. We are very proactive, and some of the critical parts of our business are run by women. But that’s fairly new. As I was coming up, there were very few women in strong technical positions. Sometimes the isolation—or the afterthought of who you are and where you are in any given conversation is a challenge. [As a woman], you have to be more direct. One of the advantages is the diversity of thought. You can’t stereotype women and men, but I think there are some characteristics that are natural to women. I’m more of a tomboy, so I learned Legos, but I also got invited to the table to play Barbie. There are no winners and losers in Barbie. But when I hang around with my male colleagues, everything is a sport. They were brought up with G.I. Joe and winners and losers. Sometimes that cultural norm comes across even in the workplace. The diversity of how we think and see things improves the conversation, and I think we get better results when we have both genders at the table to come up with the best solution or a more innovative idea, with people in mind. LSH: What are your thoughts about the glass ceiling for women? What has changed and what is changing in that regard? JRB: Boeing is doing wonderful things in the advancement of women in critical areas. For example, I would have never imagined in my wildest dreams that a woman would be running the defense side of our business. Our industry is changing, but I still think there are barriers. We work hard to try to level the playing field, but still, only 20 percent of women are majoring in engineering. The glass ceiling will continue to exist if we can’t penetrate some of those traditional technical fields and build a stronger pipeline of women maturated through engineering and some of the STEM-related fields. LSH: Why do you think that gap still exists in terms of women going into the technical fields? JRB: It starts from cradle to career. We are still buying Legos and math-related manipulators to help stimulate the brain around math and science for boys, while the girls are in line for dolls and fluffy toys. We also have work to do to develop a pipeline of math teachers who can inspire both boys and girls. We call it unconscious bias, sometimes, when we think about what women can bring to the technical workforce. Until we can fix those things, we are going to have a gap. LSH: When did you realize that you had a special gift in the areas of math and science? JRB: Kindergarten. I had mastered the multiplication table (up to 12) by the time I was in kindergarten. I knew all the fractions and other concepts of math by the time I was in first grade. They put me in class with my sister, who was three years older than me, because I would do all my math homework in class, and then I would be disruptive. I had the gift always in math. My brain thinks logically; I’m a problem solver. LSH: Who encouraged you and helped you gain confidence? JRB: I became self-motivated in math because I could do it really well and fast. It was like a puzzle—like a hobby. It would actually be kind of nerdy to most folks. I think I overcompensated because of my limited language arts skill set. Mr. Blocker, my fourth-grade teacher, also built my self-esteem and my math confidence. LSH: What role has faith played in your success? JRB: Everything! I had so many early challenges in my life that were catastrophic, in some cases. They could have either killed me or made me. I had an unwavering belief that I was going through some of my difficult situations as a builder of character and perseverance. My sister inspired that faith in me and would remind me every day about utilizing that alignment. It wasn’t totally automatic in my early years, but now I depend on it for every difficult situation I go through. LSH: How has luck played into it? JRB: I think we all have a purpose on this earth that is divine. It’s not a luck thing for me. But I have to say I’m pretty doggone blessed and highly favored. [Laughs]. LSH: What is your personal definition of success? JRB: Success, for me, is not driven by your personal accomplishments, but what you have left on this planet to make life for all human beings better and how you’ve been able to influence and shape the well-being of others. When you die, it’s not going to be that you got X, Y, and Z money and talent, but that other folks have benefited; you added value. LSH: How do you achieve work/life balance? JRB: I don’t have a work/life balance, but I have a work/life blend. I blend in my family. I blend in my friends. But my work is all-consuming. It’s the dominant factor in my life. The only thing that I start with always is my spiritual alignment—that’s every day. My family is important. My husband and I balance our careers. He takes care of all the administrative things at home, and that allows me to do my best work. LSH: After over 30 years with Boeing, you are pretty high on ladder. Do you have a sense of what might be next for you? JRB: They’re going to have to take me out [of Boeing] on a stretcher [Laughs]. Boeing is a company of choices and connections. I’ve had every amazing experience you can possibly have in a job, and all I think about is what’s next. We’re the No. 1 aerospace company in the world. We’re going to be the iconic industrial champion. And the new CEO is so inspirational, I’d go anywhere with him. Right now, I’m thinking about Boeing for a while. After I retire, I think the Walmart greeter? No, I’m kidding. I’m thinking that when it’s all done, I would love to do board work. LSH: What do you do for fun? JRB: I’m working on it. I golf three or four times a year. I play my piano three or four times a year…. Most of my free time is centered around philanthropic efforts, business development, and community advocacy. That is my passion. In fact, in retirement, I will probably do that full-time. LSH: What’s on your bucket list? JRB: Something artistic. I love music and art. I don’t tell a lot of folks, but I like acting. I like improv. I’d like to replace that lady that used to do the Pine-Sol® commercial—you know, the power of Pine-Sol? [Laughs]. LSH: If you had chosen a different career path, what job would you be doing? JRB: I think I would be teaching third-grade math, because I know how to do it, and I think I could turn a lot of kids around from being afraid of it to loving it. It takes the right teacher and the right way to do it, and it becomes fun. Once you get it, it opens up the art of the possible in any technology. LSH: Do you have a life motto or words that you live by? LSH: What is the most important piece of advice you could pass along to other women in business? JRB: “Acknowledge obstacles. Don’t give them power.” This is a famous quote from Vernice “FlyGirl” Armour, the first African-American female naval aviator in the Marine Corps and the first African American female combat pilot in the U.S. Armed Forces.